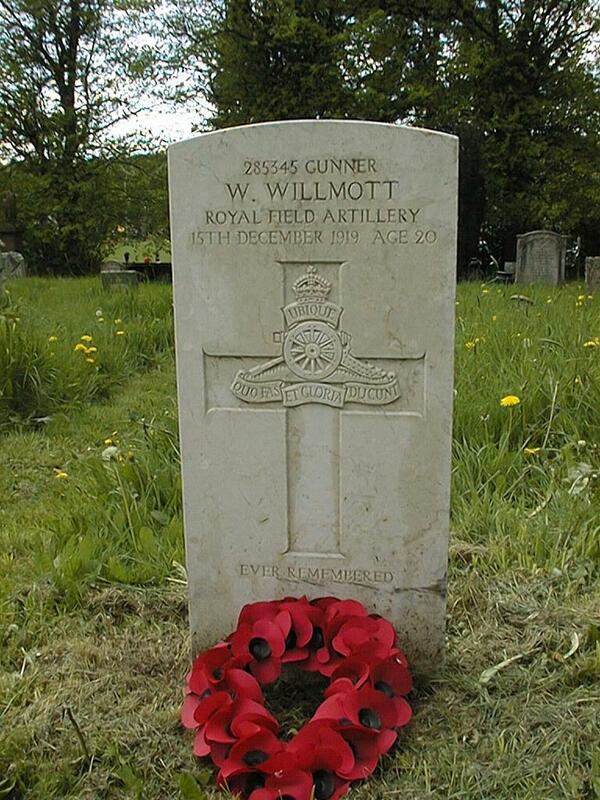 Wilfred Willmott was born at New Westwood in 1899, son of George & Annie Willmott (nee Walker), who had moved there from Selston. He was one of eleven children, having brothers and sisters George, Winifred, Annie, Lilian, Ellen, Claude, Norah, Jack William, Beryl and Maud. Wilfred’s elder brother, George, was killed in action in France during September 1918. In autumn 1919 Wilfred married Emma (nee Taylor) but in December 1919, tragedy was to hit the Willmott family when Wilfred, aged only 20 years, died of ‘Black Fever’ which he had contracted whilst in service. He died in the Whitchurch Military Hospital in Shropshire. Whitchurch Cottage Hospital was a civilian hospital which was used to treat military casualties during WW1. 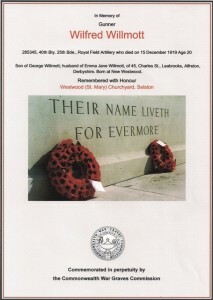 He is listed on the Jacksdale War Memorial as having served but was, in fact, a casualty of the war. Wilfred is buried in a Commonwealth War Graves Commission grave at St Mary’s Churchyard, Westwood.